June 2014 - View Highlights of our 2nd Annual Men's Entrepreneur Breakfast in New Carrollton. April 2014 - View Highlights of our District 7 Candidate Forum in Suitland. March 2014 - PFC Coalition hosts Free Workshop on "How to Start a Nonprofit" in Clinton. February 2014 - PFC Coalition forms partnership with GreeNEWit. February 2014 - PFC Coalition hosts Free Workshop on "How to Start a Nonprofit" in Laurel. February 2014 - PFC Coalition hosts Free Workshop on "How to Start a Business" in Beltsville. 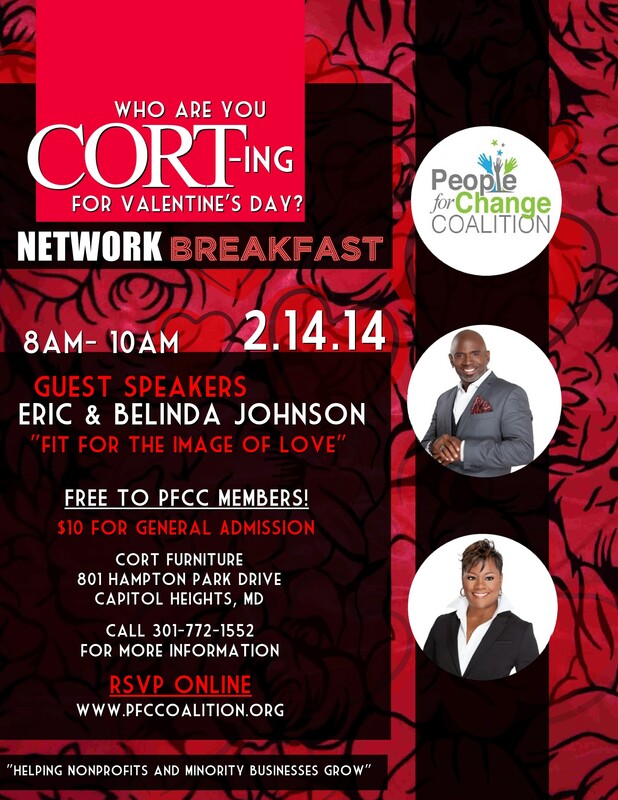 February 2014 - PFC Coalition hosts Valentine's Event at CORT Furniture in Capitol Heights. January 2014 - PFC Coalition in partnership with one of our members hosts Free Workshop on "How to Invest in Real Estate" in Largo. January 2014 - PFC Coalition hits 300 and hosts Member Celebration at Old Line Bistro in Beltsville.